#COMMITTEDINOV8 - We'Ve selected our bloggers! So you've read our October/November 2018 issue and had the honour of meeting the fantastic four comprising our #committedinov8 Trail Running Ambassador Squad. Consisting of a wide range of runners with a variety of skills, our careful selection ensured the team caters for all but, despite the differences, our Ambassador Squad has an important thing in common: flying the flag for all things off-road. Now well under way with the challenge, our four brave souls have been busy blogging and sharing on social media their experiences since forming the team - even the not-so positive ones. Real world, real life. So, let's catch up with our team. Since joining the Ambassador Squad, teacher and mother Louise has completed a series of fell races, including her first proper fell race in Hameldon, Lancashire. If she could be scored on enthusiasm levels, she would easily be ten out of ten. Louise says about her final race of the series: "It was great. Partly because I knew the series was over, but also it was a really enjoyable route. I ran the whole thing with a massive grin and felt like I could've gone round again when I finished!". However, it's quite clear that she isn't stopping there. Despite taking a week off for a holiday in Portugal, she says: "Obviously I'm planning on running while I'm there. Then I've got another fell race to do the day after I get back." The race she's talking about is the Golf Ball Race in Rawtenstall - a distance of 5 miles and an ascent of 900 feet. Even though her love for fell-running is rather new-found, her passion and determinism for the sport is clearly stronger than ever. It seems it's the natural setting of trail running that helps to spur her on, claiming that she came to realise road running wasn't for her because she found it, "too boring". About her trip to Madeira in May, she recalls: "I ran in the ecological park overlooking Funchai. The drive to the park was breathtaking enough but this was totally eclipsed by the views when running..."
"It was a stunning place to run and I found myself ignoring the burn in my legs as I was left speechless at the ranges draped in clouds around me." Even though there are plenty of great fell runs within a mile of Louise's Accrington home, it seems as though she likes to likes to take her fell running to more exotic heights. 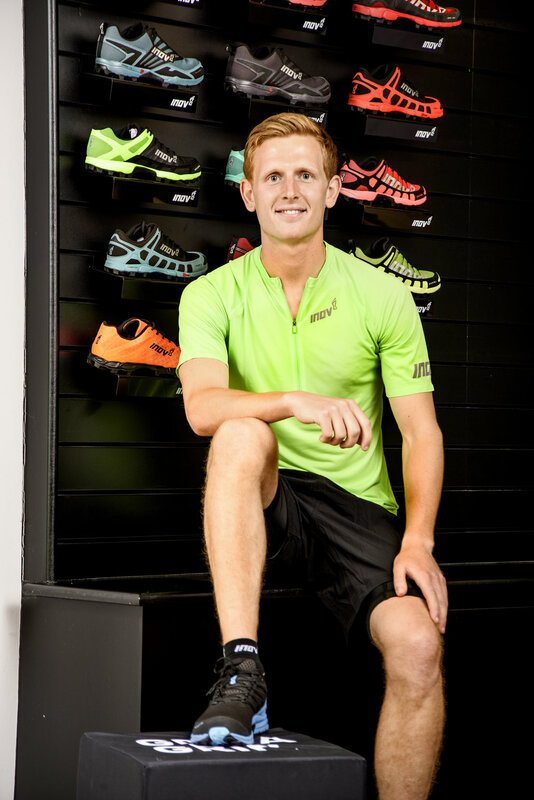 Passionate about both road and trail, Greg is a road runner by week and a trail runner by weekend, when he heads to the Peak District to enjoy a trail race. Much like a superhero you might say, but which is his alter ego? Greg planned to take his running more seriously over the summer, which comes as a natural progression for him due to growing faster and faster over the past four to five years. While on his travels in August, Greg completed many a climb up the mountains in Austria along with a 10km run in Munich. Yet he didn't stop there. Back here in the UK he took part in a 16-mile race in the Peak District, the Bakewell Park Run as well as a trail run around Edale Skyline. With a distance of 15 miles and an ascent of 3000 feet, an easy feat it is not. "Taking his running more seriously" may be an understatement. Although Greg's passion is not limited to trail running alone, it's the love of trail that inspires him. He recalls: "On a snowy February morning, I ran with my dog Ivy for eight miles along The Roaches near Leek in the Peak District. There was nobody else around and it was completely clear and still. It reminded me why I love trail running - there's no better way to escape the hustle and bustle of the working week." Unfortunately Angharad is yet to fully recover from her injury, about which she says: " My ankle niggle has been diagnosed as an anterior tib-fib ligament strain and as a result it's been a lot of basic rehab exercises with a few physio sessions thrown in." It is clear that returning from injury is her top priority and she planned to enjoy the summer as much as she could before beginning work in veterinary medicine. Despite being young, Angharad has a significant history of sport - both in hockey and trail running. As a former hockey player, Angharad was eager for a new challenge and became quickly involved in races - all the way up to half-marathon length. It was as a student that she really got into trail running, when she enrolled in the university running club. "Two years ago I ran 30km up and around Snowdon during the first Love Trails festival. It was the most challenging run I've ever done both mentally and physically," she recalls. That's seemingly quite a drastic difference from what she's been up to since the injury. According to Angharad: "Training hasn't been more than a mix of walking, gentle cycling, free weights and yoga just to keep my body moving." Since becoming retired, it seems that older veteran Mick hasn't taken a single break, and it's only fair to assume the same goes for during this challenge. After an already formidable 20 years of running experience, including three marathons under his belt, he returned to Britain from working in Alaska. Mick brought with him a new-found love for ultra-running. "I started when I was in Alaska but on a treadmill," he recalls. With more time on his hands following retirement, he only upped the ante and, at the beginning of 2018, planned to partake in events such as the Darnley Challenge, the Weald Trail Race and Race to the King. However, the idea of beginning ultrarunning was implemented several years before, during a trip to Lanzarote in 2016 and after biking solo from Land's End to John O'Groats in 2017. About Lanzarote, Mick writes in a blog post from January 2018: "An intention to briefly visit Lanzarote then Africa eventually led to my living in Lanzarote for four months, long enough to train and complete IRONMAN Lanzarote. "It's practically impossible to believe Mick had once undergone open heart surgery and, perhaps Mick himself can't even wrap his head around how much has changed within his lifetime. As he recalls his time in Lanzarote he says: "I still can't believe the progression happened so quickly, accelerating by my life plan by an entire year." Mick always seems to be searching for a challenge, one of the main reasons why ultrarunning greatly appealed to him. "The possibility of running ultra floated into my head, I turned it over, tasted the idea. It ticked the boxes, challenging but occasionally believable," Mick recalls. Not only is he challenging himself, but he is committed to improving himself. In his blog post from January 2018, he writes: "Looking back in my log, I can barely find a long run at a conversational pace, always pushing too hard, lessening enjoyment and increasing injury. So I am determined to make a difference in training this time, adding to what I have learned on the much longer endurance events."